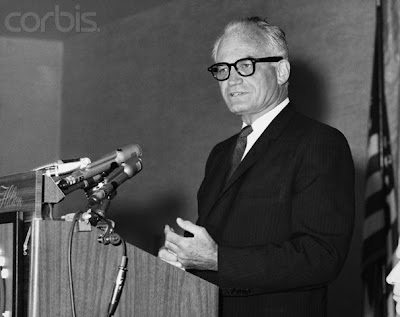 Today we are visited by the ghost of Senator Barry Goldwater whose chili is in my crock pot downstairs. Senator Barry Goldwater's chili calls for ground beef, tomato paste, cumin, chili powder and pinto beans. Dried pinto beans too. I hate all this canned-bean business. That is a picture up above of Senator Barry Goldwater who was the Father of Chili. Did I say the Father of Chili? I meant the Father of Conservatism. Howard was just laughing about how vilified Sen. Goldwater used to be in his memory. Howard's father said he was a warmonger and Mad Magazine used to have at him. But now we toast Sen. Barry Goldwater and we agree with many of his philosophies and, most importantly, we eat his chili. It is fun to get to know famous people through their recipes. Once at the paper I had to call the pops conductor Skitch Henderson and my first words to him were, "I want to thank you for your wonderful Texas Fudge Cake recipe. I have made it so many times!" That was an ice breaker, I will say that! Here is a picture of Skitch Henderson whose real name was Lyle Russell Cedric Henderson. Skitch Henderson's cake was more like candy so you did not have to worry about it rising right. That was what made it wonderful. The recipe was in an old Vogue cookbook and when I was in college my friends and I made it for all our parties. Back to Senator Goldwater and his chili. 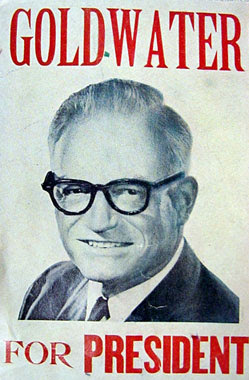 Besides creating the best chili Senator Goldwater had the greatest glasses. They are almost as good as Leonard Pennario's classic 1960s glasses! I love that picture. I love those glasses. Also I love how sitting on the Steinway is someone's takeout coffee, or something? 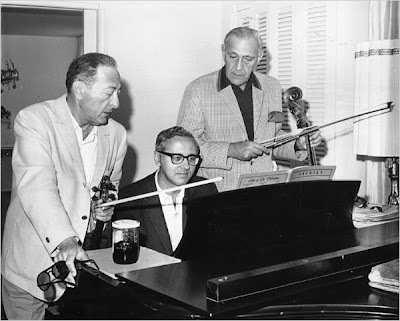 It is probably Jascha Heifetz's because that is Heifetz on the left. Pennario like most guys could not cook his way out of a paper bag. I am afraid I do not have any recipes of his to pass along, zut alors. Yes, that is a great picture! LP might not have had a recipe for cooking but he had the very best one for making brilliant piano music, lol! Speaking of famous people and their recipes, I can vaguely remember an actor who died young and his sausage still prevails. His name was, 'Jimmy Dean'! Different Jimmy Dean. The sausage Dean is still kicking at 81, was a great country singer, actor, and business man. LOL... just read that long-ago Jimmy Dean comment and laughed out loud. Jimmy Dean Sausage. LOL! I wouldn't know if he was dead or alive.